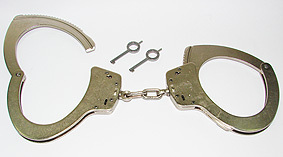 The offered US handcuffs are made by Smith & Wesson, the famous weapon manufacturer and Winchester. We also offer Peerless and CampCo products. The Peerless belly chain is available in two sizes - 152 cm and 198 cm. The restraint is fully nickel plated for rust resistance and durability. 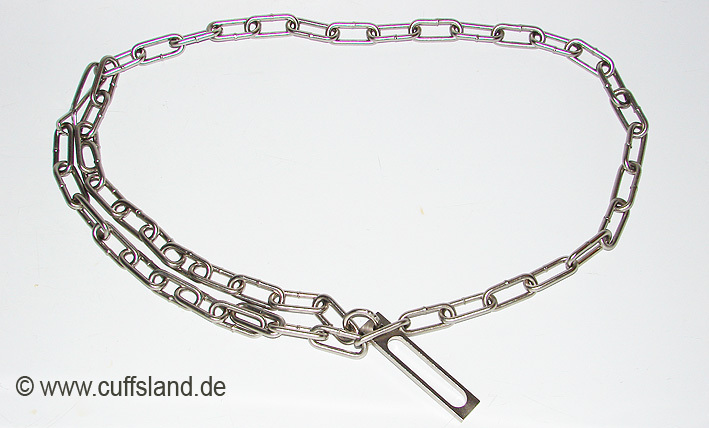 To use, insert steel link at the end of the chain through a link in the chain at appropriate fit around prisoner's waist and thread handcuffs through link to form an instant high security transport restraint. No additional padlock is needed. 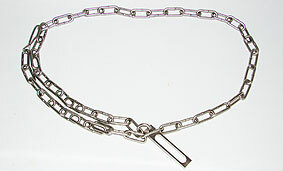 The link accommodates chain or hinged handcuffs including oversized handcuffs. Includes clip at end to secure excess chain. The belly chain also works with the "Thompson Blue Box" and "C&S Black Box". 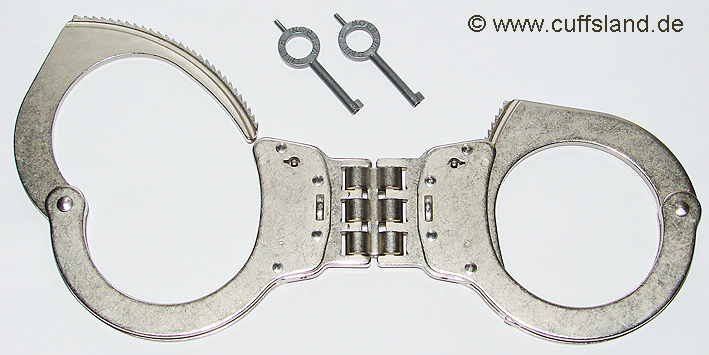 These handcuffs are licensed by UZI, maker of the world famous submachine gun. The UZI logo is stamped in both cuffs. The nickel plated restraints are made for official police use. They can be securely double locked by small push button on the sides which are operated by the key pin. To unlock the double lock, the key has to be turned counter opening direction. This slightly simpler (two identical cuffs) version is also officially licensed by UZI. The UZI logo is stamped on both cuffs. The nickel plated restraints can be securely double locked by small push buttons on the sides which are operated by the key pin. To unlock the double lock, the key has to be turned counter opening direction. This model is available in three versions: nickel plated and black or pink coloured. Here are the matching leg irons to the UZI handcuffs shown above. They are also licensed by UZI, maker of the world famous submachine gun. The UZI logo is stamped in both cuffs. The nickel plated restraints have I minimal inside diameter of 6.7 cm x 6.1 cm and a maximal of 6.9 cm x 8.2 cm. The chain length is 42 cm. They cuffs can be securely double locked by small push button on the sides which are operated by the key pin. To unlock the double lock, the key has to be turned counter opening direction. M-100 are classical American police handcuffs. 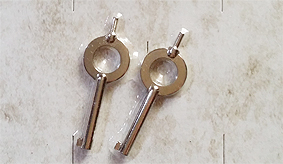 They are nickel plated and of very high quality. The double lock is activated by inserting the key-thorn into the slot and pushing a little pin in direction of the keyhole. To unlock this double lock you must turn the key to the direction of the chain. These cuffs are also available "blued" (black, which is not the same as "melonite"). This variant of the famous S&W M-100 is not nickel-plated but has a black finish instead, which consists of very durable melonite. Otherwise the restraint is absolutely identical to the standard model shown above. This is a variant of model M-100. Here the double lock is not activated by key but via small levers on the sides, which can be simply and quickly pressed by finger. This variant of the S&W M-100 M&P is not nickel-plated but has a black finish instead, which consists of very durable melonite. Otherwise the restraint is absolutely identical to the standard model shown above. M-103 is a variant of M-100 made of stainless steel. Otherwise they are absolutely identical in design and function. M-104 is a high security version of M-100 shown above. 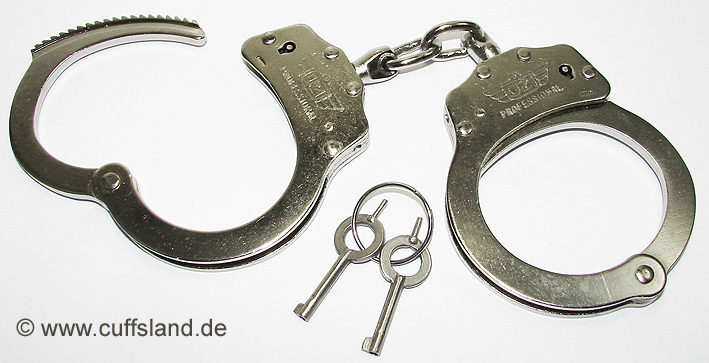 These handcuffs use a special key which is thinner and has an extra shaped key bit. The restraint cannot be operated by a standard handcuffs key. Otherwise M-104 are identical in function to M-100. M-300 is the hinged version of M-100, the classical American police standard. These nickel plated high quality handcuffs show all advantages of M-100. The double lock is activated fast and easily by inserting the key-thorn into the slot and pushing a little pin in direction of the keyhole. To unlock this double lock you must turn the key counter opening direction. These cuffs are also available "blued" (black). Smith & Wesson M-1900 leg irons are optimal shaped to adjust to the human ankle. That means less pressure to the Achilles heel. The chain is about 37 cm long. This nickel plated restraint is of typical high Smith & Wesson quality. The double lock is activated fast and easily by inserting the key-thorn into the slot and pushing a little pin in direction of the keyhole. To unlock this double lock you must turn the key to the direction of the chain. According to the manufacturer M-110 are oversized handcuffs for very large wrists. In deed they were built in connecting the cuffs of M-1900 leg irons by only two chain links instead of a long walking chain. So M-110 could also be used as very rigid leg irons. This nickel plated restraint is of typical high Smith & Wesson quality. The double lock is activated fast and easily by inserting the key-thorn into the slot and pushing a little pin in direction of the keyhole. To unlock this double lock you must turn the key to the direction of the chain. These cuffs are also available "blued" (black). Smith & Wesson Model 1 chain universal handcuffs are the successor to the highly established M-100 model. 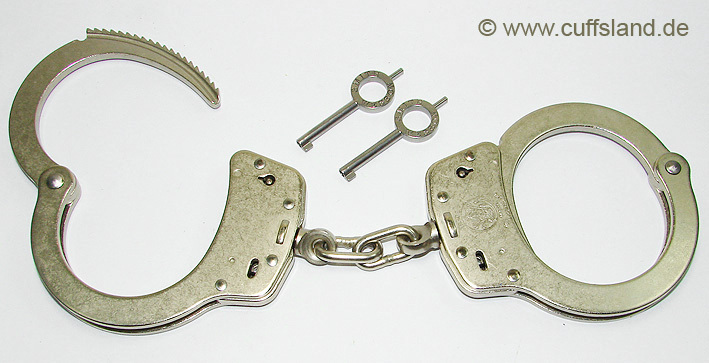 These satin nickel handcuffs with double lock via small push-pins work well for all wrist sizes. Compared to the M-100 the cuffs open 25 per cent larger for big wrists and close 25 per cent smaller for thin wrists. Smith & Wesson M-1H hinged universal handcuffs are the successor to the highly established M-300 model. 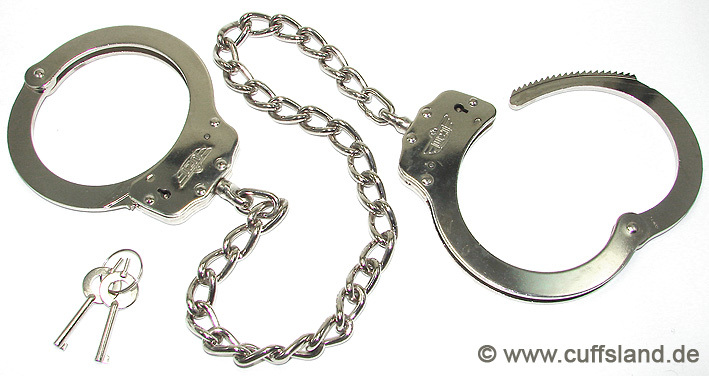 These satin nickel handcuffs with double lock via small push-pins work well for all wrist sizes. Compared to the M-300 the cuffs open 25 per cent larger for big wrists and close 25 per cent smaller for thin wrists. Official Humane Restraint neoprene liners with hook and loop material - protect skin on wrists and ankles when handcuffed. 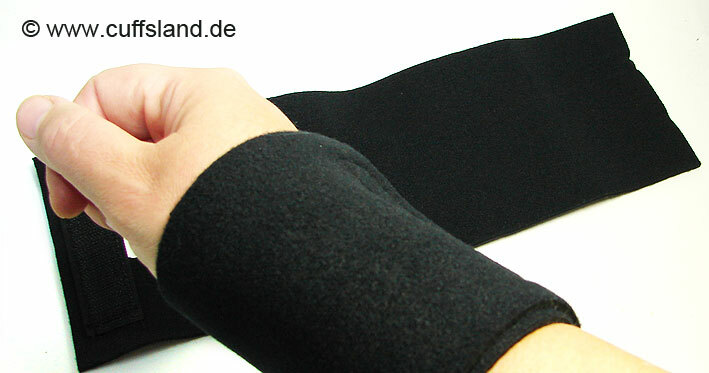 Sizes: 10 cm x 30 cm (wrist-protector), 10 cm x 38 cm (ankle-protector). 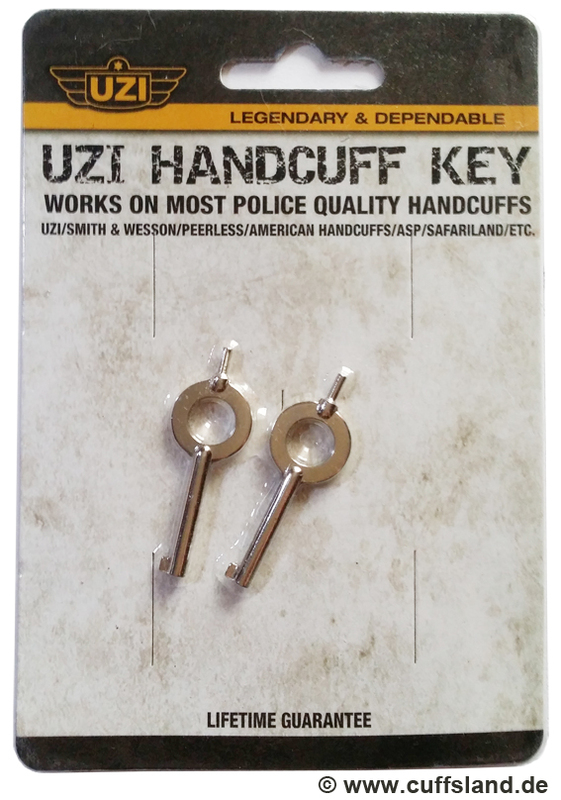 Original UZI handcuffs keys (2 pcs). Original Smith & Wesson or Peerless standard keys, which do not only operate restraints of these brands, but also many other modern handcuffs (please feel free to ask). The Smith & Wesson key is a bit thicker at the handle, what makes it handier than most other standard keys. 2 pieces of standard handcuffs keys made by American Handcuff Company. They can be used with most models from American Handcuffs, Smith & Wesson, Hiatt and Alcyon as well as with many no name models from Taiwan. Please feel free to ask us if you are not sure if the keys fit to a particular model. To use these keys with Clejuso handcuffs, you have to file the key a little bit.